After losing our opportunity to fly in February because of the weather, we were really excited to be able to fly in March. Though the lower cloud ceiling and higher wind in the morning cause us to limit our flying to smaller engines, but the afternoon, we were in full swing launching several mid power birds. With the break in weather came lots of new faces, and plenty of flying. WELCOME! Though the day was still cloudy (and chilly!) we had a full day of shooting right up to the last rack. Then came the rain! We had so many flyers and spectators and launched so many rockets that we once again ran out of flight cards and resorted to reusing the backs. Carl Campbell added another scale rocket to his already impressive collection, a Bumper 8, modified V-2). Very pretty. This time Carl and Jason avoided the rocket eating tree in the northwest corner of the field. We did find one other hungry tree with a Astron model which caught several thermals and managed to just snag a branch in the trees to the west–up 30 feet made it out of reach. The flying pencil took the most flights for the day. We also saw three gliders today. One lost it’s nose weight and fluttered to the ground. Winston C sent his new boost glider up twice, and had beautiful ascents, but unfortunately tangled with the booster pod twice. Knowing Winston, he’ll be back next month with a solution. 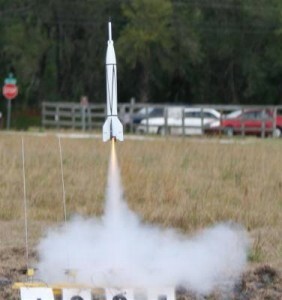 Welcome too, the Howard Middle School Team America Rocketry Challenge team of Leslie and Allan! Their two egglofters were in for maiden flights and testing. Fortunately, they had two rickets, since their first flight on an Estes E9-4 managed to not deploy recovery and made scrambled work of the egg. Number two flew much more like it should and landed to the south in a clearing. Our best to all the teams and hope to see more of you join us on the field! All-in-all, it was a wonderful day for a launch. See you on Saturday, April 7th.